If you thought the original Mpow Flame wireless earbuds were great, well, you’d be correct. They’ve been best-sellers on Amazon for years now because they offer great sound quality, a comfortable fit, sweat-proofing, and impressive battery life at a price that’s more than reasonable. What you might not realize though, is that there’s a newer version of these fan favorite headphones available right now. 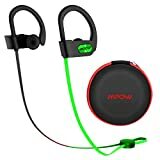 What’s more, the Upgraded Mpow Flame Bluetooth Headphones with Bassup Technology only cost $20.89 right now on Amazon after you clip the 5% on-site coupon. That makes the newly upgraded version just 90¢ more than the originals, which are currently on Amazon for $19.99! SHINE YOUR LIFE ALWAYS: Get rich, powerful sound from our Mpow Flame Bluetooth headphones. They’re engineered to stay in place and stay comfortable. We’ve packed them full of technologies so you can push your workouts to the limits.